Aimee Turner is a country girl, living and working on her family’s sheep station in rural Australia. Life is easy and full of hard, dusty work, but when her brother Joseph decides to become a contestant in a reality TV dating show, Romancing the Farmer, everything goes to hell. The station gets overrun by city women and stuck-up producers right in the middle of shearing season. Justine Cason, the ringleader of the circus Aimee instantly detests is an irritating arrogant presence that she is forced to chaperone around the massive property. The two women find more in common than trading insults the more time they spend together, sparking an unexpected connection neither was looking for. 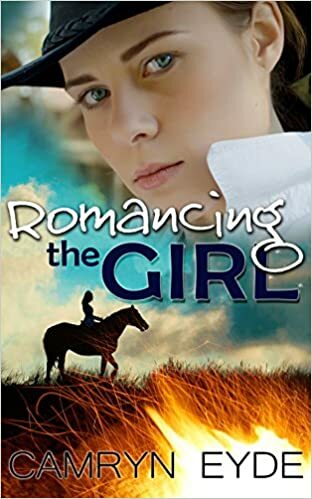 As Joseph navigates the dating scene, and Aimee’s sister Sally navigates a crumbling marriage, Aimee’s life turns on its head in more ways than one when her blooming connection with Justine is the catalyst to leaving the land she loves. When the worst fire season in decades strikes their patch of the world, the Turner family must find a way to save themselves and the ones they dearly cherish. Can they put aside their differences to protect each other? Prior to reading Romancing the Girl, I always assumed that cowboy culture was an exclusively American tradition. I admit, when I thought of cowboys it was never in regard to their actual job of managing cattle on horseback. Cowboys were men who drank Budweiser, smoked Marlboro cigarettes, and hung out at the O.K Corral. Please excuse me while my Murica bubble bursts, as I am mind-blown that cowboys exist outside of movies, outside of rodeos, and outside of the United States. Learn something new everyday, right? It’s too bad Aimee’s older brother Joseph didn’t know about FarmersOnly.com before signing up for a reality TV show to try and find true love out on the range. He really could’ve saved himself a lot of trouble. When Justine and her camera crew show up at the Turner Family Station, Aimee’s life is turned upside down and inside out. After witnessing a horrific tragedy during her childhood, she isn’t too keen on hosting any “city slickers” at her ranch. She’s definitely not happy about babysitting Justine, who only seems to aggravate her just by being there. Putting it mildly, Justine is an unwelcome guest in Aimee’s world. Has anyone ever frustrated you to the point that you just wanted to kiss the living heck out of them? No? Umm… Me neither? But this is exactly what happens with Aimee and Justine. Readers can feel the heat rising from the pages when these two are within the same vicinity of each other. Without even trying, Justine has an uncanny ability to get under Aimee’s skin. As it turns out, this is exactly what she needed. More specifically, Justine is exactly who Aimee needed to open her heart, heal from the past, and help her move forward with the future. Romancing the Girl is a powerful story about love and family, and pulling together during moments of joy and pain. It’s a wonderful read that will warm you from head to toe. You’ll be daydreaming about riding across the great plains with a beautiful cowgirl after this one. Btw, FarmersOnly.com is a real thing. Their commercials are super cheesy and borderline creepy. This particular one made all the women look like they’re one hop step away from Stepford Wife status. They REALLY need to hire better advertisers. We’re looking for humans, not scary robots. Pour into a shot glass. This drink is NOT meant to be sipped. This is meant to be taken as a straight shot. If you sip, you will gag! You may want to have a lawn mower handy, since this drink will put a thick lawn of hair on your chest.